An angel wing cane Begonia. I love begonias. That may sound like a strange obsession for a “forest gardener”, but it is my strange obsession. I remember buying a hanging basket of blooming angel wing Begonias with tiny dark burgundy and green leaves at the farmer’s market when I was living in a third floor walk up. It made my small screened in porch more beautiful, and made me happy. Since then, I’ve always had a soft spot for adding beautiful begonia plants to my collection. 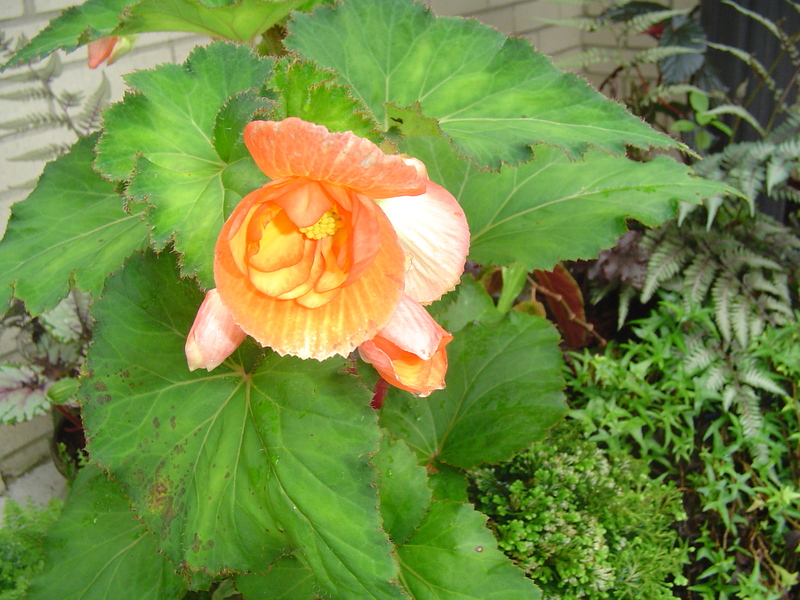 The first bloom of the season on a tuberous Begonia. The catalog advertised this as a cascading variety, but the growth is vigorous and upright. Cane angel wing begonias growing together in a hanging basket in July. Begonia Bolivienses in partial sun. When the soil is too wet the stems will rot off at soil level. Weeks of rain will do that…. 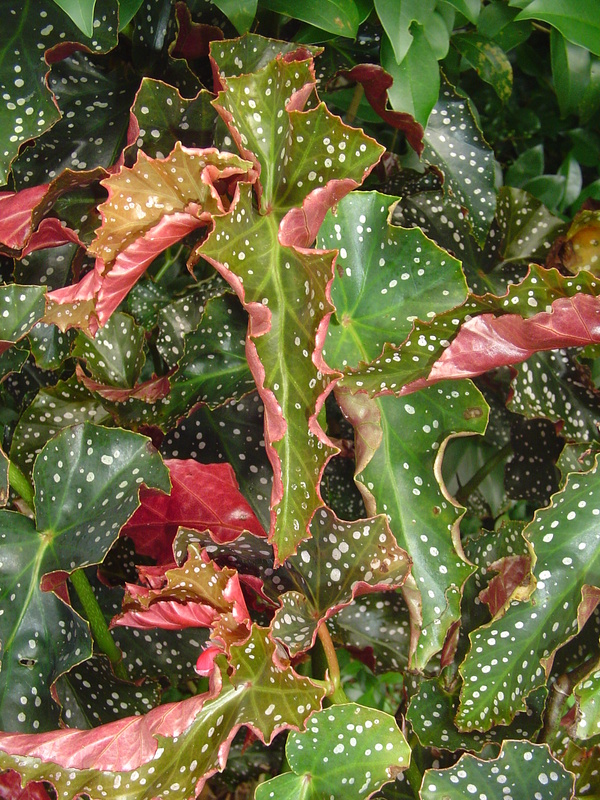 There are thousands of cultivars in the genus Begonia. Whether grown for their outrageous leaves or their abundant bright flowers, Begonias can be found from tiny to tremendous. 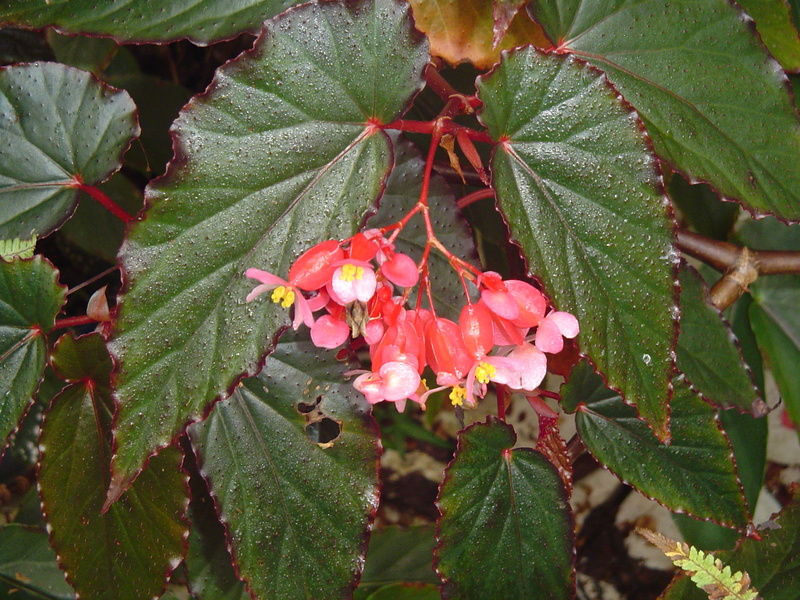 Begonias work in a forest garden because they appreciate shade. Although some, like the new Dragon Wing cultivars and Begonia “Bolivienses” can take hours of sun each day, most are quite happy growing in permanent shade. They also require very little care. Most like to dry out a little between waterings. 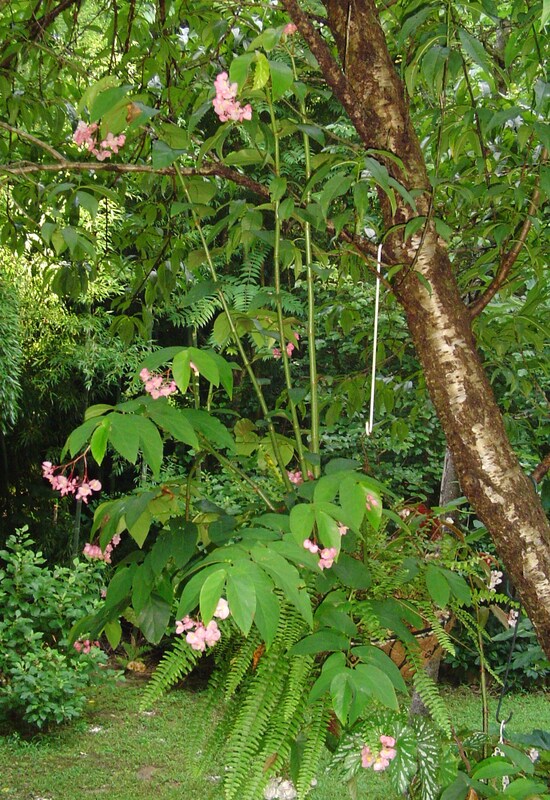 They stand up to the heat and humidity of my Virginia forest garden partly because they originate in the mountainous tropical forests of Central and South America and Southern Asia. 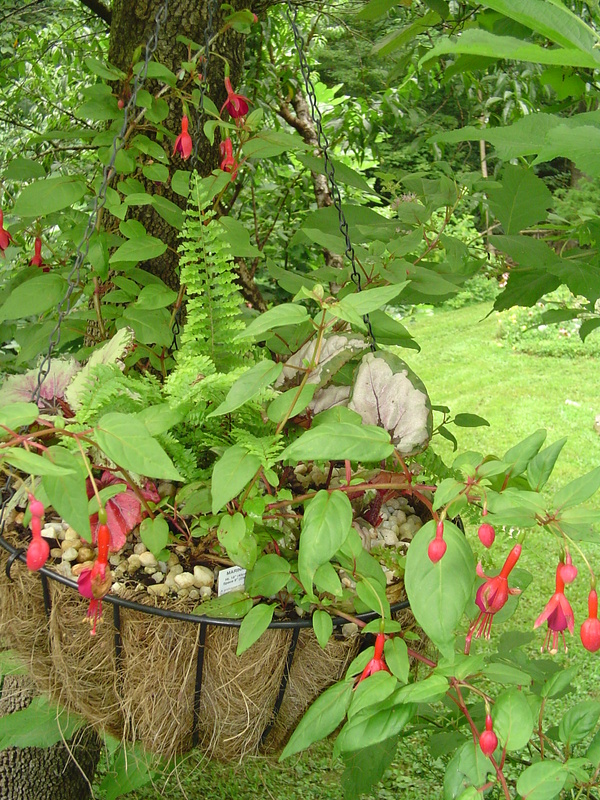 Rex Begonias grown with Fuschia Marinka and ferns in partial sun. Although some cultivars of hardy Begonia are available, which survive the winter here in zone 7B and return each spring; most Begonias are tender perennials and must spend the winter inside where the temperatures don’t drop below the mid 40s. They are happy growing in the house, where they get some daylight from windows, and bloom happily throughout the winter. Many of my Begonias overwinter in a sunny garage. They may lose a few leaves when moved out into the garden in the spring, but bounce back quickly with new leaves once they adjust to the brighter light. A tiny wasp visits the flower of this Rex Begonia. 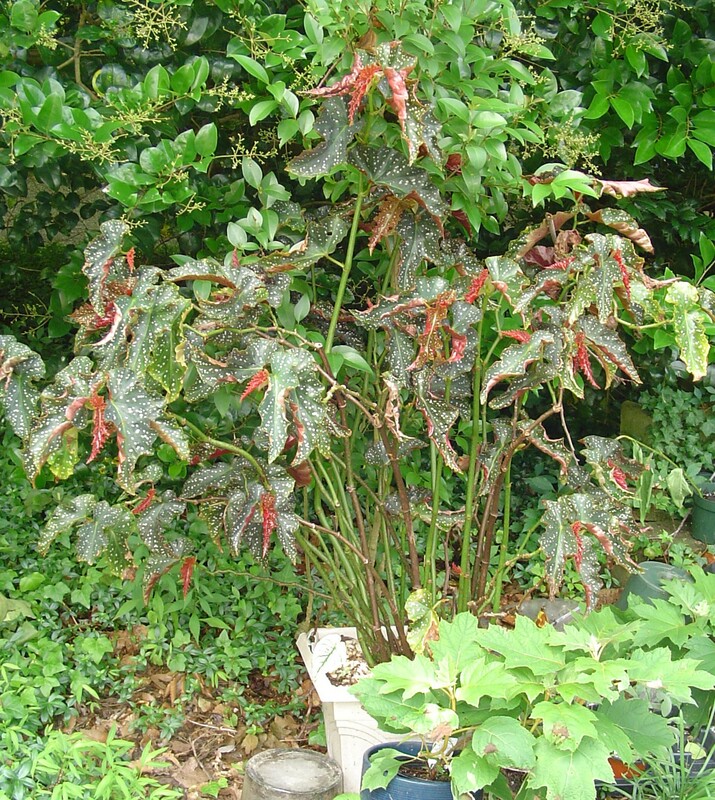 Begonia Gryphon, grown in a protected shady corner, began the season in a 4″pot, and and grew this large by September. Garden centers are full of bedding Begonias (Begonia Semperflorens) and Dragon Wing Begonias in the spring. Begonia Semperflorens, also known as wax Begonias, or popular because these small, neat plants produce an abundance of small red, pink, or white flowers during the entire growing season. Many commercial landscapers fill huge beds with these plants, but often plant them in too much sun. When they get too much sun and dry out the foliage browns and looks ratty. Growth is stunted, and the plants lose their beauty. These plants are easy to start from stem cuttings. 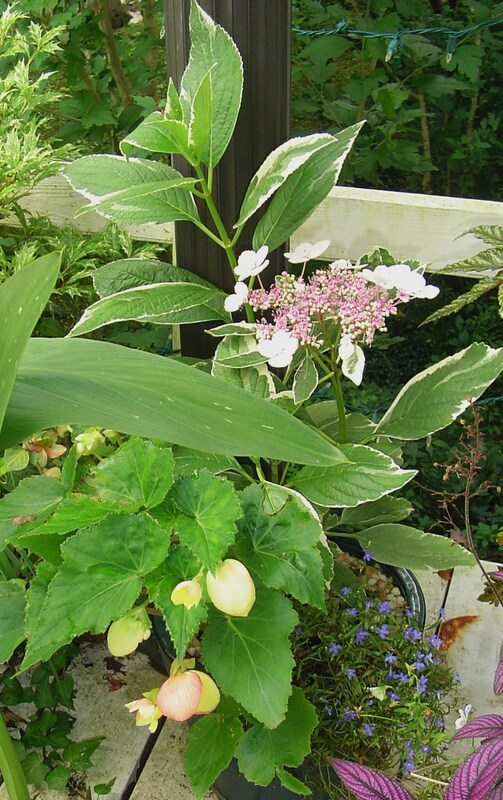 There are some varieties with variegated foliage which trail more than they grow upright. I love these in hanging baskets growing in partial sun. 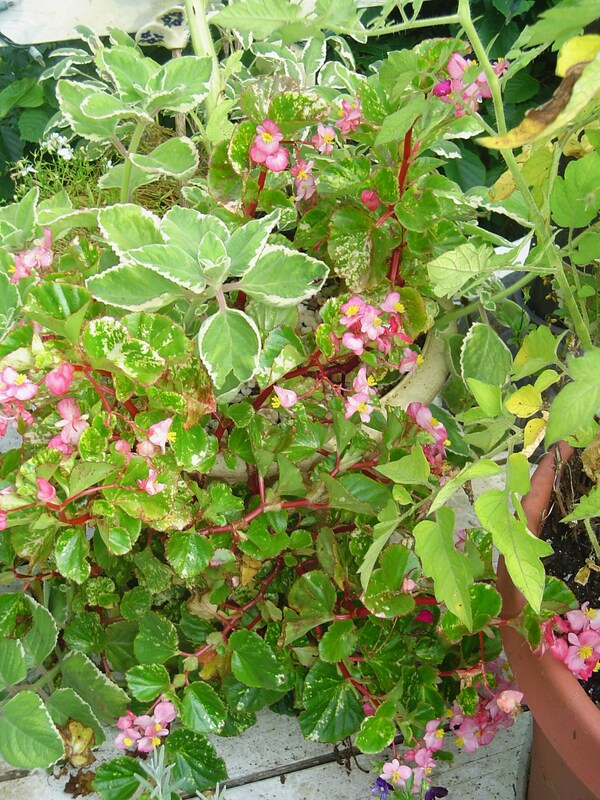 A rare, variegated Begonia Semperflorens growing with Plectranthus. Begonia “Gryphon” is new to the market. Widely available for only the past three years, it is grown for its huge foliage. My first Gryphon grew to 4 feet tall from a 4″ pot in a single season. Putting all of its energy into leaves, I’ve never seen it flower. This is from a cutting taken from my original plant. 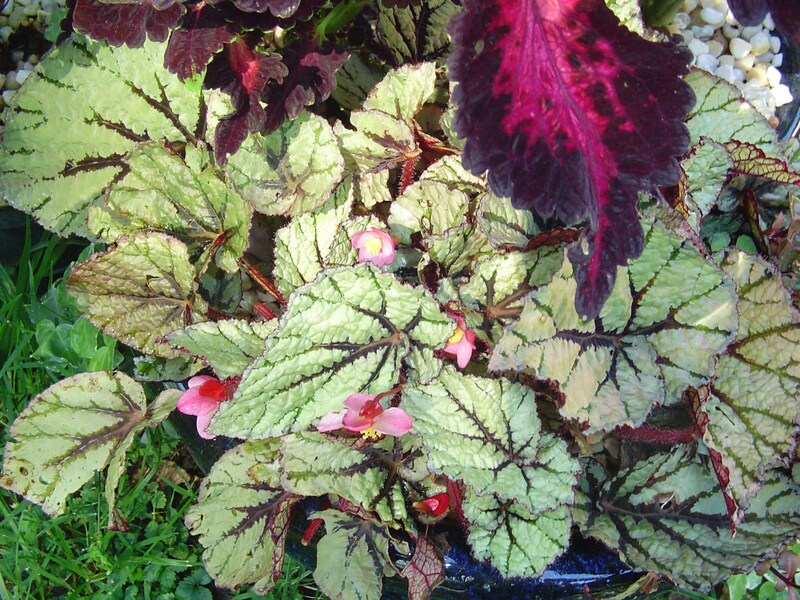 Dragon Wing Begonias have also become common spring plants in big box stores and are easy to grow. They can take sun or shade and are covered in red or pink flowers all season. 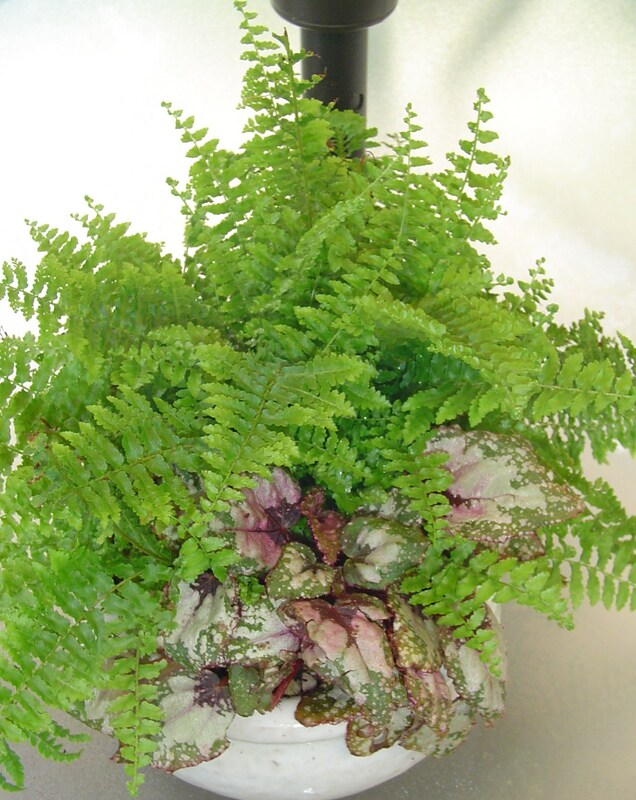 They also root easily from a stem cutting in moist soil or in water. This means you can break off a stem, push it into moist potting soil, keep it shaded and moist for several weeks, and expect it to grow into a new plant. Dipping the stem cutting in powdered rooting hormone before planting speeds the process. 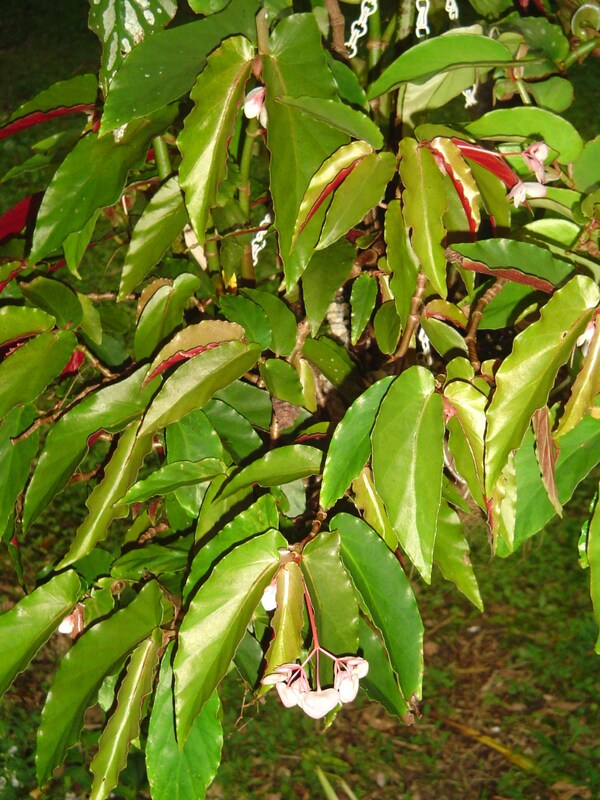 Begonia Bolivienses and Tuberous Begonia with Euphorbia grow well in the shade of a Dogwood tree. The top dressing of pea gravel discourages digging squirrels and keeps the plants clean when it rains. This cane Begonia is still adjusting to life outside after its sixth winter in the garage. Soon it will cover itself in huge clusters of peachy flowers. 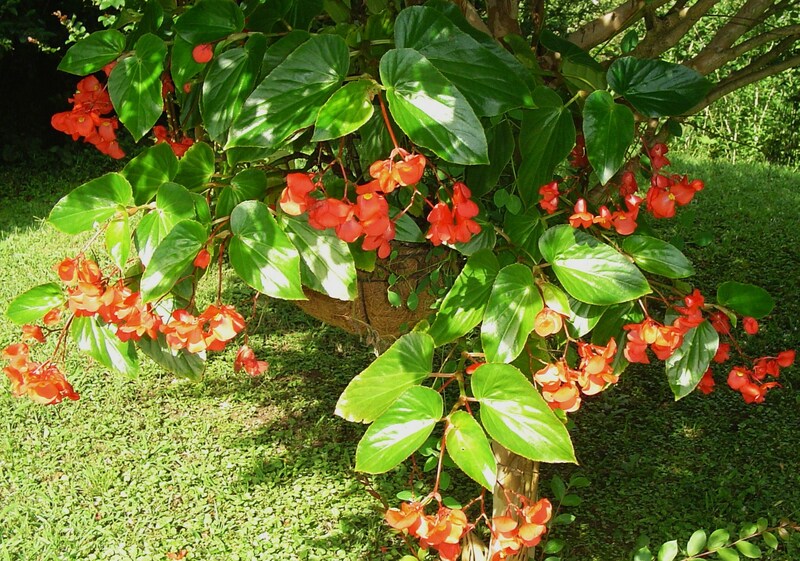 Cane type Begonias bloom generously throughout the season with many tiny flowers in each cluster. Angel wing, or cane Begonias are a little harder to find. Specialty and mail order nurseries are the most reliable sources. MacDonald’s Garden Center stocks a nice variety in spring and early summer, but their satellite stores don’t stock them. 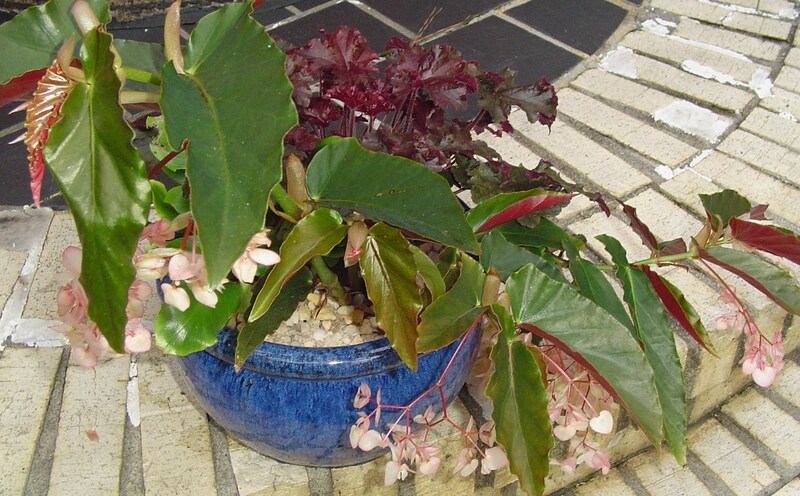 These Begonias are grown more for their huge, bright leaves than for their flowers. 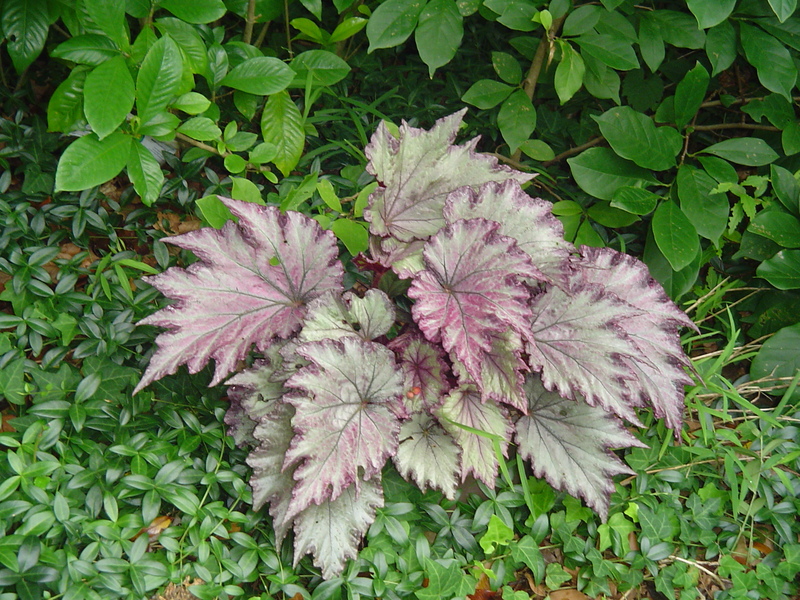 Marked with silver, burgundy, and various greens, these wing shaped leaves often grow on red stems and have dark red undersides. 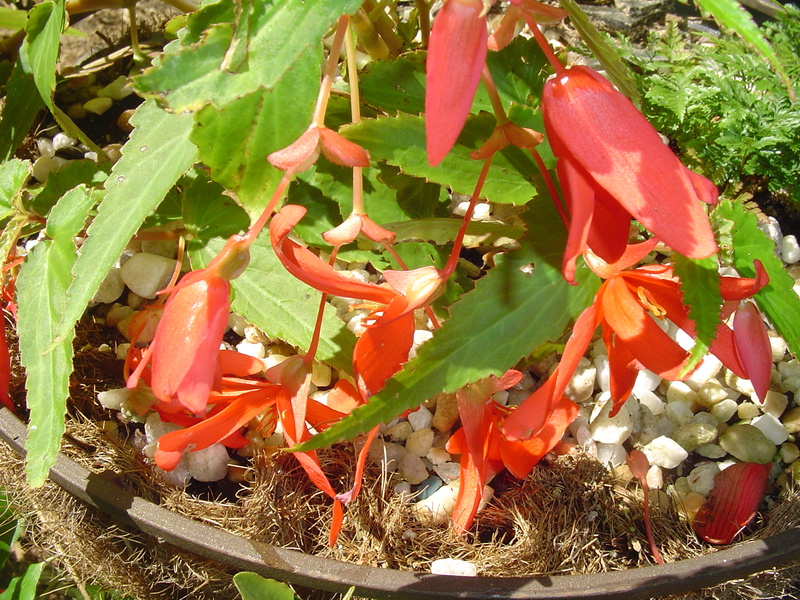 Angel wing Begonias produce clusters of flowers in white, pink, red, or orange. Sometimes there are 50 or more tiny flowers in a single cluster. Angel wing cane Begonias can grow into small shrubs and can top out over 6’ tall after several years of growth. 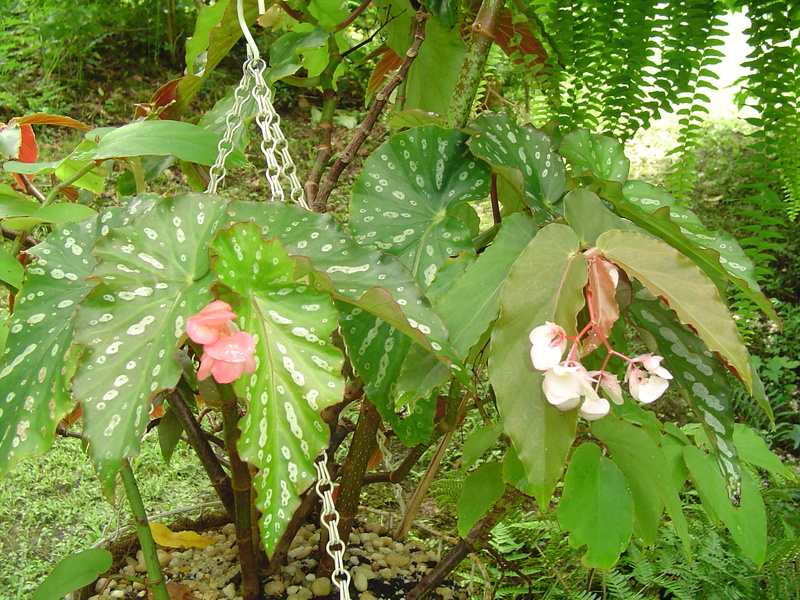 Rex Begonias are also grown for their leaves, but stay much smaller than cane Begonias. Many of the leaves are textured, intricately marked with color, and some even grow into spirals with a snail shell appearance. Rex Begonias flower, but are insignificant on most cultivars. 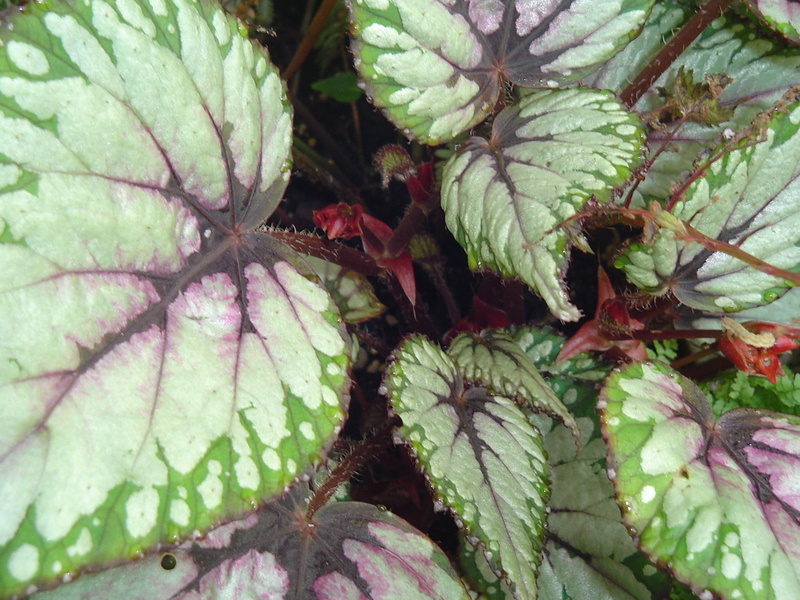 Tiny Rex Begonia plants can often be found in the houseplant section of big box hardware stores. 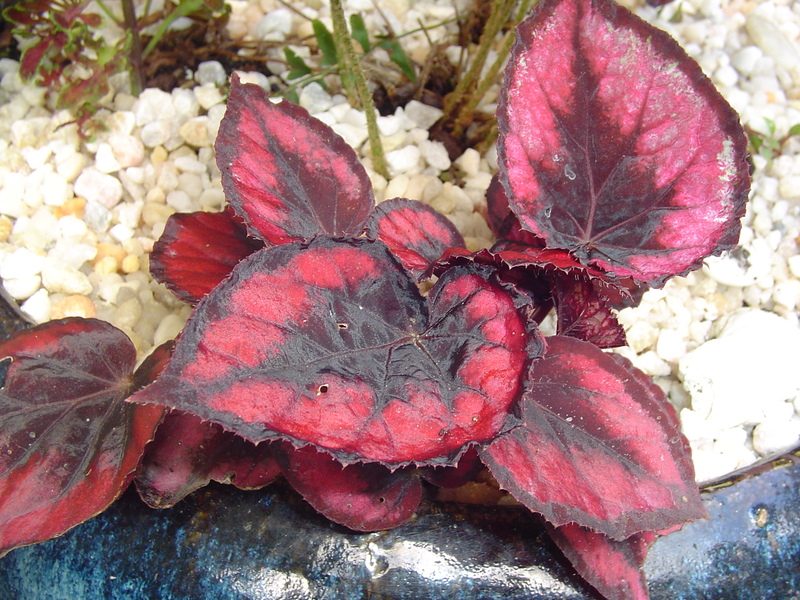 Sold in 2.5”- 6” pots, often with just a few leaves, these tiny starts will grow into impressive plants indoors or out. Pot them up so the soil will drain, feed them, give them bright but filtered light, and they take off and become beautiful plants. 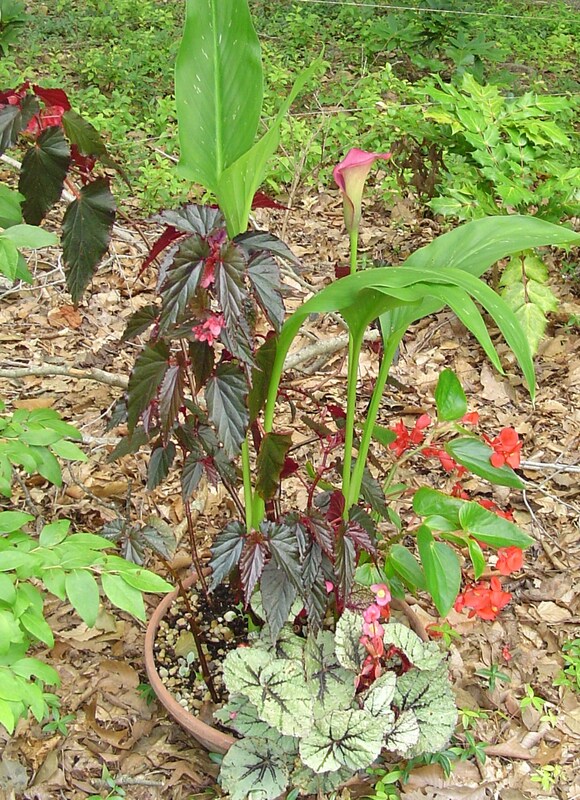 Tuberous begonia planted with Japanese Painted Fern and an Angel Wing Begonia with dark red foliage. Begonia, “Flamingo” grows very tall canes and blooms in pink. This one is in its third summer hanging in this peach tree. The tubers are started in shallow trays of soil, like caladium tubers, and then repotted into baskets or pots once they sprout. Upright or cascading, these hybrids are bred for outrageously beautiful flowers in every shade of red, pink, white, yellow, and orange. Double, triple, picotee, and fringed, these flowers can mimic roses, water lilies, and anemones. When kept watered and fed, they bloom for months. Sadly, this is the hardest begonia for me to grow, because they absolutely must have the proper moisture. If they get too dry, they droop. Too wet, they rot. I’ve killed more than my share of these beautiful plants, and am cautious in buying them. 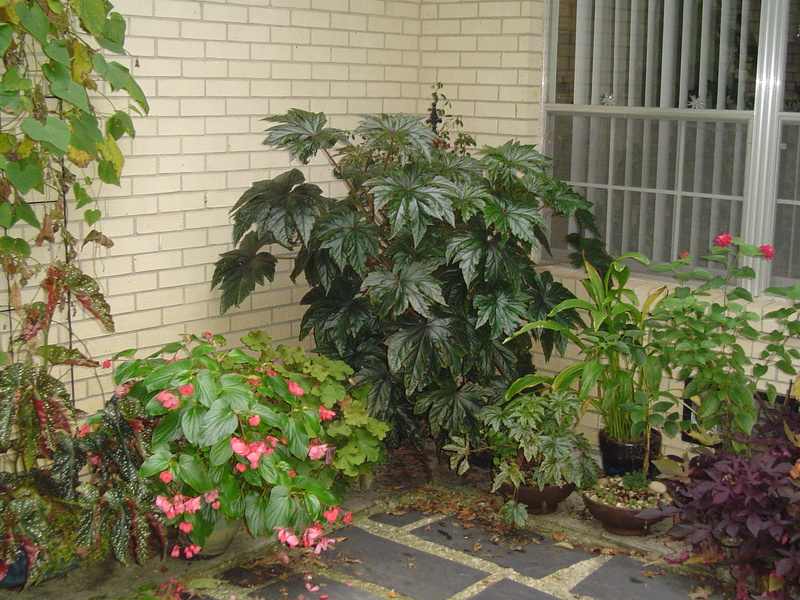 Hardy begonia, blooming in early September with ferns, ivy, and Creeping Jenny. Hardy Begonias are beautiful in a shady border. These are technically “tuberous” Begonias, as they have an enlarged area at the bottom of each stem underground which survives the winter, but these plants are very easy to grow. These make their re-appearance each year in the late spring and can grow to 18”-24” by late summer. 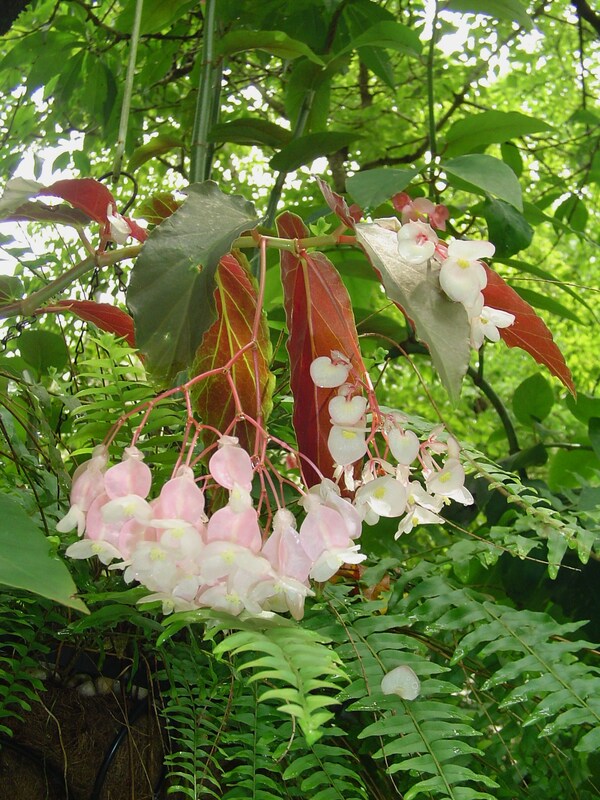 They bloom, like an Angel wing Begonia, with clusters of white or pink flowers and increase each year. Interestingly, they self sow and new plants often crop up in other parts of the garden. These are beautiful grown in beds with fern and Hosta and are a good plant to grow on top of spring bulbs. Begonia Rex growing with a lady fern. Begonias grow quickly and make beautiful displays either alone, or in potted arrangements with other shade loving plants. 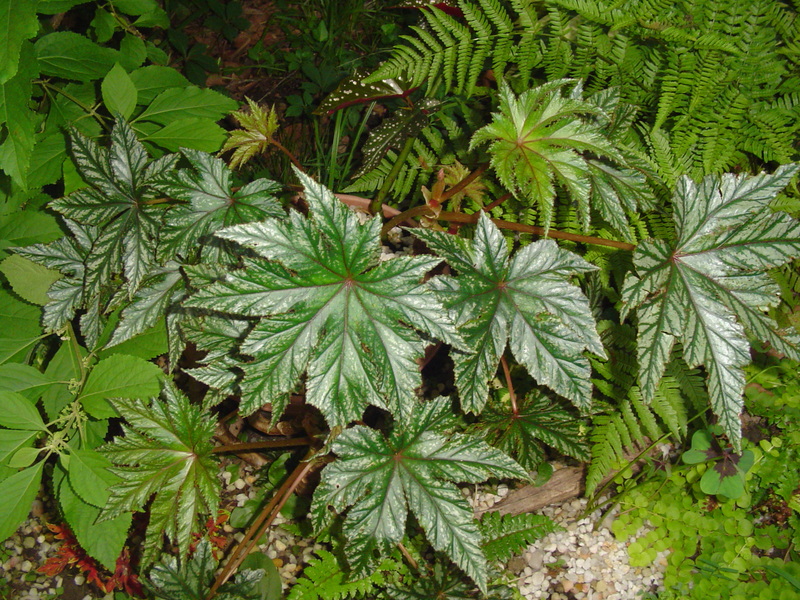 Although heavily hybridized over the last century, most cultivars retain the tough constitution of the forest plants originally collected from the mountains of South America and Asia by determined collectors who loved Begonias enough to search them out in the wild and bring them home to Europe and North America. 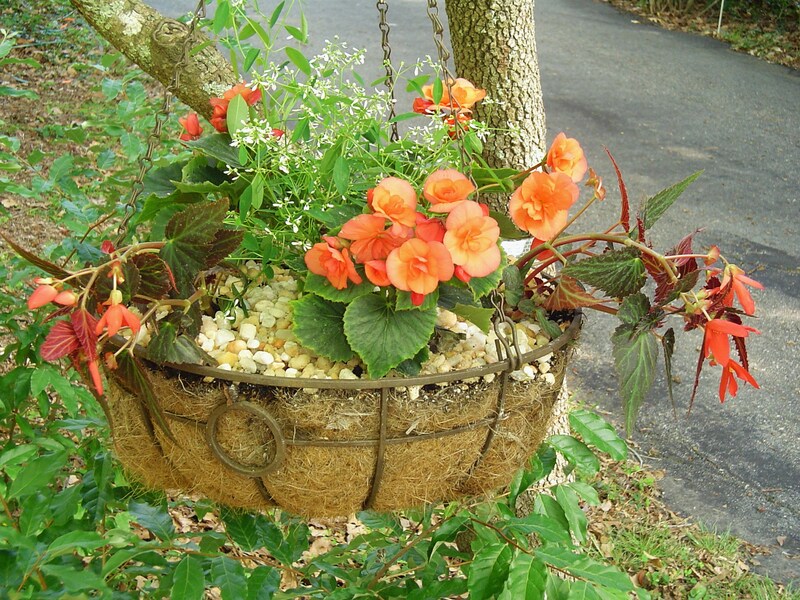 Cane Begonia, “Torch” in a hanging basket. 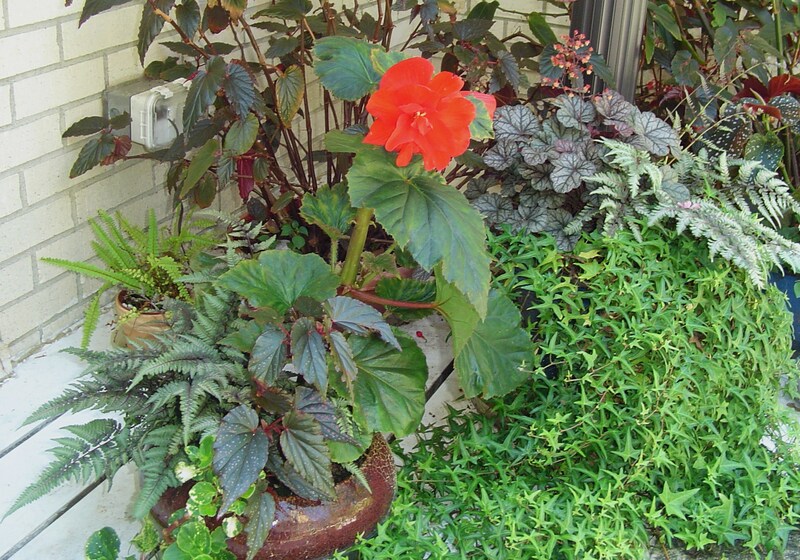 And finally, I’ve just learned about the Queensland Begonia Society, in Queensland Australia. Please visit their site for excellent articles on Begonia care and propagation, and for their stunning photos of the Begonias in their care. Here overwintered cuttings of an Angel wing begonia and a Dragon wing begonia grow happily with a Rex Begonia and a calla Lily. What an enjoyable and informative article about begonias! I love them, particularly the rex ones. Logee’s Greenhouse in CT has an amazing variety of begonias. Are you familiar with them? I only grow the hanging variety outdoors in summer, let them die back in the fall, then store them in the cellar. In the garden, the slugs decimate them and in the house in winter, it is too dry and cool at night (below 60) so I’ve not had great luck with them. Perhaps one day, I’ll attempt a terrarium with a heating cable! Yes, it is a tuberous form with orange pendulous blooms, B. boliviensis ‘Firecracker’. I bought it impulsively several years ago and it had three 2″ corms in the pot. This will be its fourth summer. One corm perished so I have two and they measure at least 5″ across! Last year I put only one in the pot and another in the ground and the slugs weren’t too bad. I need ducks or more toads! Hi there! This is an excellent and lovely post indeed. 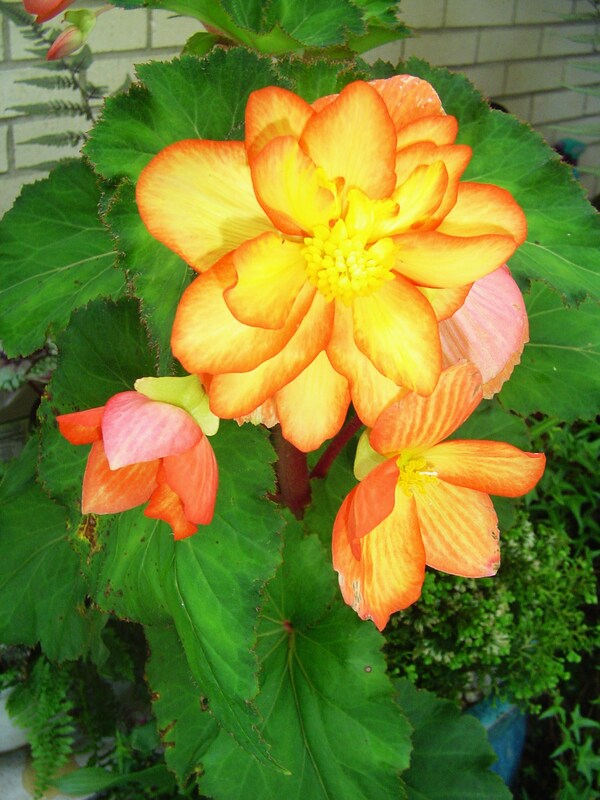 Thank you for blogging about gorgeous begonias. As far as SoundEagle knows, the related article http://williamrheameredith.wordpress.com/2013/07/21/welcome-to-tuberous-begonias/ that you cited above is no longer available as the author(s) has/have deleted the site. Thank you so much for letting me know about the link, Sound Eagle. 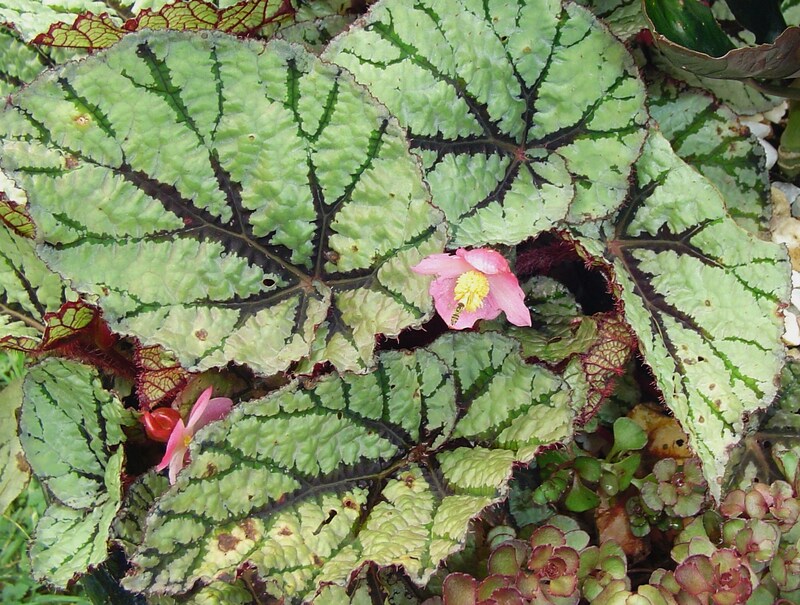 Reblogged this on Queensland Begonia Society. Definitely a nice flower with many varieties.